Just 100 days after the Proton X70 was launched, the national automaker delivered the 8,500th unit of the SUV to Malaysian law firm Lee Allen Hishamuddin & Gledhill (LHAG). 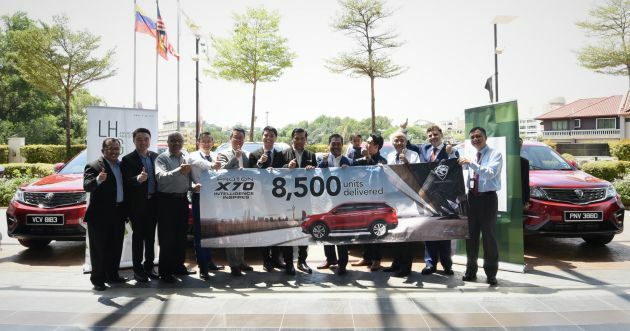 This milestone means the X70 has broken all previous records for delivery numbers in the C-segment SUV category, effectively making Proton one of the leaders in Malaysia’s SUV market. According to a statement released by Proton, it achieved a cumulative sales growth rate of 42% for the first two months of 2019. This means it has the highest sales growth rate among the top three automotive brands in Malaysia by way of volume. The main driver for this is the X70, which was the most popular model for January and February (as per official registration figures). At the going rate, March is for the taking as well. The post Proton delivers 8,500 units of X70 in the first 100 days, becomes one of the leaders in Malaysia’s SUV market appeared first on Paul Tan's Automotive News. 0 Response to "Proton delivers 8,500 units of X70 in the first 100 days, becomes one of the leaders in Malaysia’s SUV market"